Castles are alive with the stories of the past and the events, exhibitions and activities of today. Whether you fancy a majestic fortress, grim prison or luxurious mansion you'll find a great family day out at one of Britain's castles. Framlingham in Suffolk is an impressive example of a 12th century medieval castle which has maintained its original character over the centuries. The spiral staircases and 13m curtain walls, the dry moat and ornate Tudor chimneys make for a great family day out. There are a number of events which take place throughout the year at Framlingham, including Knight School where your children can learn the skills of a medieval warrior and attend sword-fighting lessons to fight in a mock battle! If you’re a fan of the timeless children’s classic The Jungle Book, then a trip to Bateman's in East Sussex will be a treat for the whole family. This beautiful Jacobean house was home to Rudyard Kipling from 1902–1936 and is still home to the author’s oriental artefacts and the original illustrations of the Jungle Book. Events surrounding these novels and annual festivals take place in the beautiful garden which boasts a river and working water mill. Such days out include Family Fun days, Kipling literary days, Paint the garden, Easter Egg trails, Jungle Hunt trails and Hallowe'en trails. With spectacular coastal views over Abersdeenshire, Scotland, Dunnottar Castle stands on the edge of a sheer-sided rock, 50m above the sea. It’s famous for holding out against Cromwell’s army for eight months and saving the Scottish Crown jewels for Charles II. William Wallace and Mary Queen of Scots were other famous residents in this fortification. In total, eleven buildings remain which include the 13th century chapel and 17th century ballroom. For excellent views, historical events and a great place for a family picnic, this Scottish jewel is worth a visit. A wonderful example of a Tudor castle can be seen in St Mawes Castle in Cornwall. All visitors enter the fort via a small bridge into the central tower and there’s lots of room inside for children to explore and run around. Make sure you don’t miss the cannons and the unique decorative carvings within this clover-leaf shaped fort. Nearby is the sister castle, Pendennis Castle and family events take place both here and in St Mawes. The Grand Medieval Joust will transport you back in time and there is even an opportunity to see Henry VIII and experience Tudor times. Osborne House is Queen Victoria’s palace by the sea. After her first visit to the house on the Isle of Wight, England’s longest-reigning monarch wrote: ‘It is impossible to imagine a prettier spot’. In the mid 19th century, Queen Victoria and Prince Albert bought Osbourne House and rebuilt it as an 800-hectare estate and family bolthole. The Swiss Cottage is a favourite with children with its child-size furniture and the play area is the ideal place to let off steam. There are acres of parkland and gardens to explore and relax in, which you can enjoy on foot or in a horse-drawn carriage. A restaurant and café are on hand for family refreshments. Steeped in royal history, Sudeley Castle was once the home of Katherine Parr (Henry VIII’s last wife), and was also visited or lived in by Anne Boleyn, Lady Jane Grey and Elizabeth I. However, after lying empty for 200 years it was restored by the Dent and Brocklehurst families. It now has a busy calendar of events from Meet the Tudors to the House of Fairy Tales and families can appreciate the grounds and the exhibitions it boasts. Such exhibitions include the Emma Dent Collection and her correspondence with Florence Nightingale. 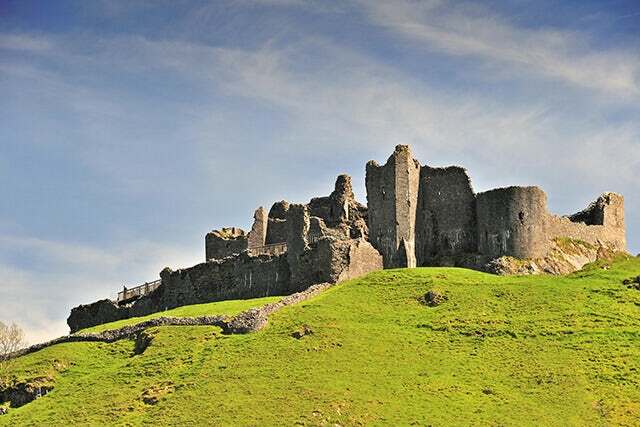 Appearing suddenly from behind hedgerows of the winding country roads, Carreg Cennen Castle, Wales, entices you to make a speedy advance. Perched high above the Welsh countryside, it commands great views of the Black Mountain. This 13th century castle, which was involved in the War of the Roses, has a unique atmosphere and is fun for families to explore. To the south east corner of the castle, a steep stairway leads into the bowels of the castle, and into a damp and narrow limestone cave. Be sure to take a torch as you will soon be plunged into complete darkness as it takes you right under the castle. With 360 degree views of the Solent and the Isle of Wight, Hurst Castle stands at the end of Hurst Point in Hampshire, over a mile out into the English Channel along a shingle walk. Built by Henry VIII in 1544, Hurst Castle has had a varied history; Charles I was held prisoner here before being executed in London and it was subsequently used in the Napoleonic wars and during the two World Wars. The castle has a 12-sided Tudor Keep housing a narrow staircase and many small nooks and crannies, ideal for a game of hide and seek with the children. There are also exhibits on display and a working lighthouse right next door, so there is something for every member of your family. The Palace of Holyroodhouse is the Queen’s official residence in Scotland and is situated at the opposite end of the Royal Mile from Edinburgh Castle. In the 12th century, Holyroodhouse was founded as a monastery and the ruins of the abbey can still be seen today. However, it became a royal palace and was home to Mary Queen of Scots whose bedroom and belongings are still on view. Find out more about the historical importance of Holyroodhouse with the audio guides available on site, ideal for the whole family. Castle Howard is an enchanting 18th century palace, home of the Howard family situated in the Howardian Hills Area of Outstanding Natural Beauty. The unique setting in 1,000 acres of parkland offers breathtaking views. Within the grounds you can relax in The Walled Rose Garden or have family fun feeding the peacocks, boating on the lake and enjoying the adventure playground. Castle Howard has several exhibitions running including Brideshead Revisited, The Women of Castle Howard and The Building of Castle Howard among others.